This year's Grammy Awards seemed to be all about women. The Recording Academy held the event Sunday night in Los Angeles, California. 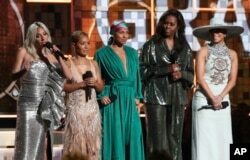 At last year's ceremony, the organization’s chief, Neil Portnow, said women need to "step up" to deal with the lack of women nominated for the major awards. Many stepped up and onto center stage this year. Early in Sunday's ceremony came a surprise appearance by former American first lady Michelle Obama. Along with artists Jennifer Lopez, Lady Gaga, Jada Pinkett Smith and Alicia Keyes, Obama told the crowd what music meant to her. "From the Motown records I wore out on the Southside to the 'Who Run the World' songs that fueled me through this last decade, music has always helped me tell my story." Obama also said, "Whether we like country or rap or rock, music helps us share ourselves, our dignity and sorrows, our hopes and joys." Keyes was the host of Sunday's 61st annual Grammy Awards, which honors some of the year's best music. 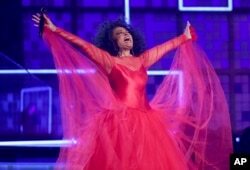 This year’s show also honored the American music greats Diana Ross and Dolly Parton. Ross sang several of her famous songs as she walked through the crowd. Later she told those at the gathering, "Thank you for being here and celebrating my 75th birthday." Ross’s real 75th birthday is March 26. Miley Cyrus sang to her godmother Dolly Parton as part of the tribute to the country music superstar. Cyrus was joined by Kacey Musgraves and Katy Perry to sing Parton's Here You Come Again. Parton and Cyrus also sang Jolene. Musgraves' Golden Hour won Album of the Year for country music. Her song "Butterflies" won Best Country Solo. Artist Cardi B. accepted the Grammy for best rap album for Invasion of Privacy. It was the first time a woman has won that award. Lady Gaga won best pop solo for Joanne (Where Do You Think You're Goin'?). Gaga and Bradley Cooper won best pop duo/group performance for Shallow. Ariana Grande won her first Grammy. The award for best pop vocal album went to the singer’s, Sweetener. She did not attend the ceremony, however, after having a public dispute with the show's producer. Dua Lipa earned the Best New Artist prize. Dua Lipa accepts the award for best new artist at the 61st annual Grammy Awards on Sunday, Feb. 10, 2019, in Los Angeles. H.E.R. took home the best rhythm and blues album award for H.E.R. And H.E.R. and Daniel Caesar won best rhythm and blues performance for Best Part. Fern Robinson reported this story for VOA News. Caty Weaver adapted it for Learning English. Ashley Thompson was the editor.